One of the first things I felt I needed to do when I got to Berlin was to try currywurst. 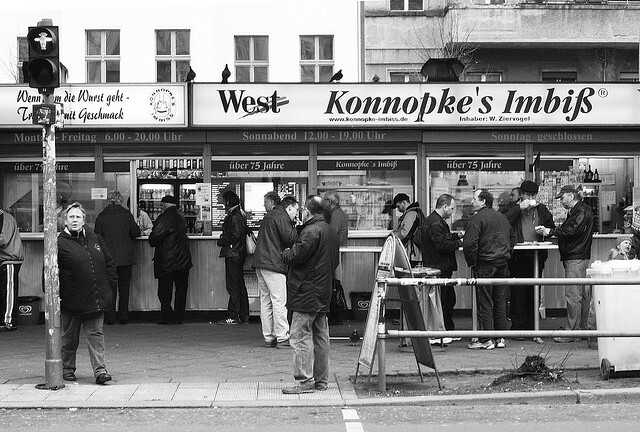 Luckily the hostel I was staying in was just a couple of blocks down from the Berlin's oldest currywurst place Konnopke's Imbiss in Prenzlauer Berg. 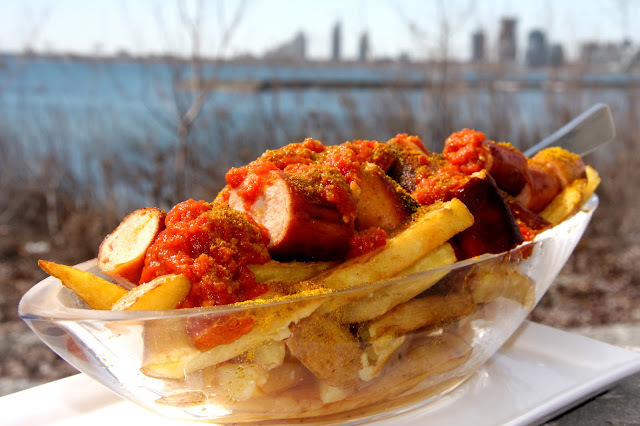 Currywurst is a pretty simple but tasty snack that seems to be loved by everyone. A German style pork sausage usually bockwurst is deep fried, cut into pieces, and topped with a ketchup-like tomato sauce and curry powder, and usually served with french fries or a bread roll. This combination was invented in 1947 by Herta Heuer, who was influenced by American and British soldiers who loved ketchup and curry powder respectively. 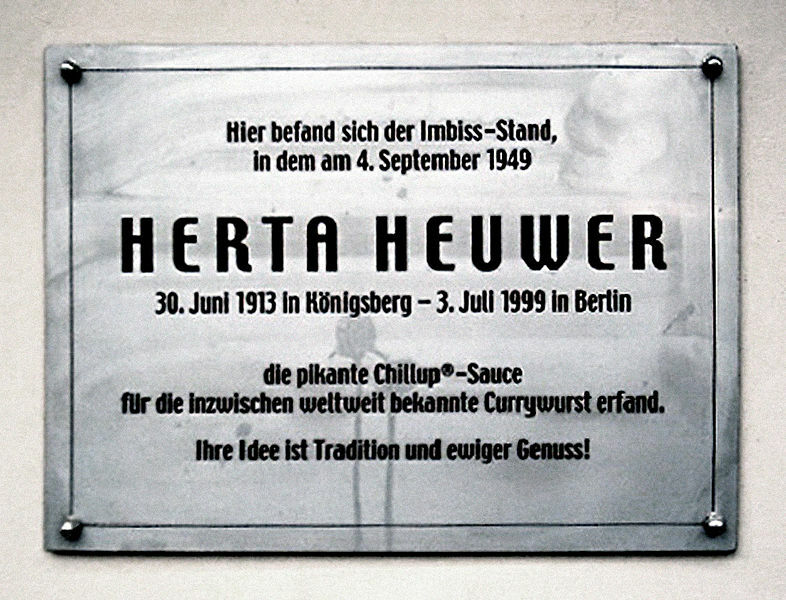 A plaque has been erected on Kantstraße in the Charlottenburg area of west Berlin in her honour. When you order your Currywurst you can ask for it skin on "Currywurst mit Darm" or without skin "Currywurst ohne Darm". Apparently mit Darm is more popular in West Berlin and ohne Darm in the East. If you order it "scharf" extra cayenne powder is sprinkled on top. 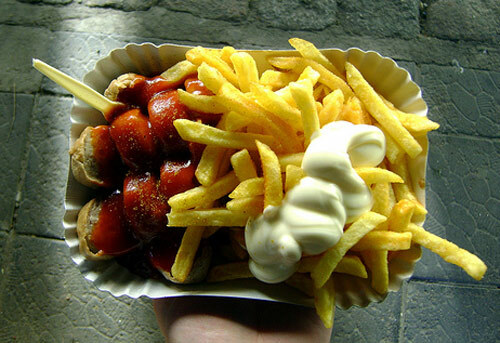 If you get currywurst with fries, mayonnaise is usually added. 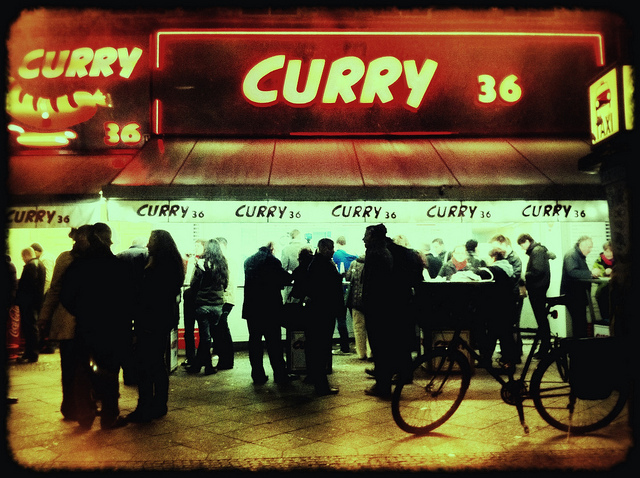 Like most local delicacies there is a debate over who serves the best currywurst in Berlin. I ate at ﻿Konnopke's, Curry7 in Kreuzberg, Curry36 also in Kreuzberg, and at Alexanderplatz from a "grillwalker". In my opinion Curry7 was the best, but it was after bar hopping at the many bars and patios in the area. Most cite Curry36 as the best. 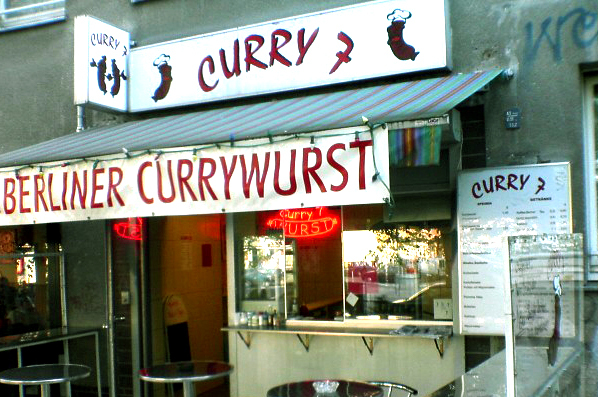 A map of popular currywurst locations in Berlin can be found here: http://gridskipper.com/. 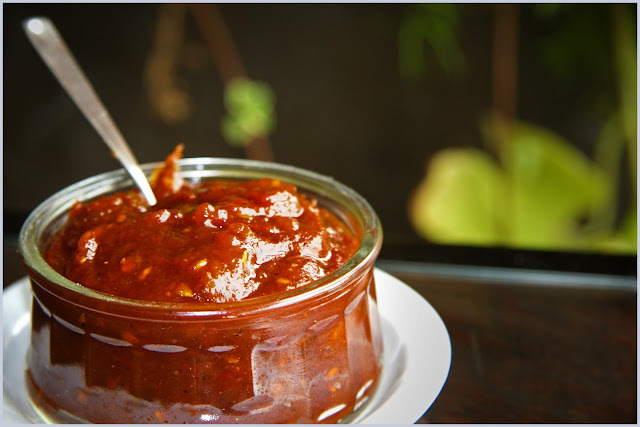 Most currywurst sellers have their own special recipe for the curry ketchup, but stores also sell ready-made curry ketchup, which is nothing like you get at a proper imbiss. Hela seems to be the most popular brand. I used to buy it at Aldi in Copenhagen and find it strangely addictive in it's own right. "scharf" is the only way to go. 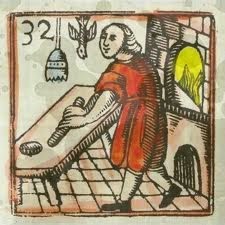 A "grillwalker" sells wursts from a mobile kitchen strapped around his neck, a bit like a old time cigarette girl. I don't know if their unique to Alexanderplatz, but I didn't come across them anywhere else. Here is a video of grillwalkers in action. Over 800 million currywurst are sold in Germany a year, ﻿mostly in little snack shops called imbiss. 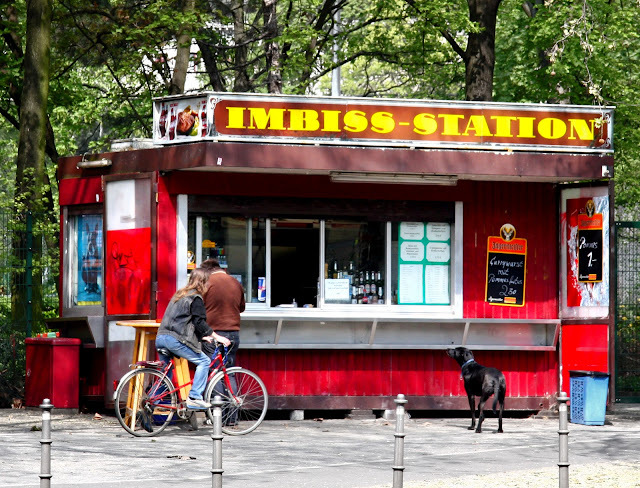 Imbiss usually sell other types of sausages on their own with condiments like the pølsevøgn in Denmark serve, as well as hotdogs, wiener schnitzel, frites, and sometimes burgers and döner kebab ( Berlin's other famous street food). The Deutsches Currywurst Museum at Schützenstraße 70 near Checkpoint Charlie in Berlin is dedicated to everything currywurst and has fun interactive installations and events. 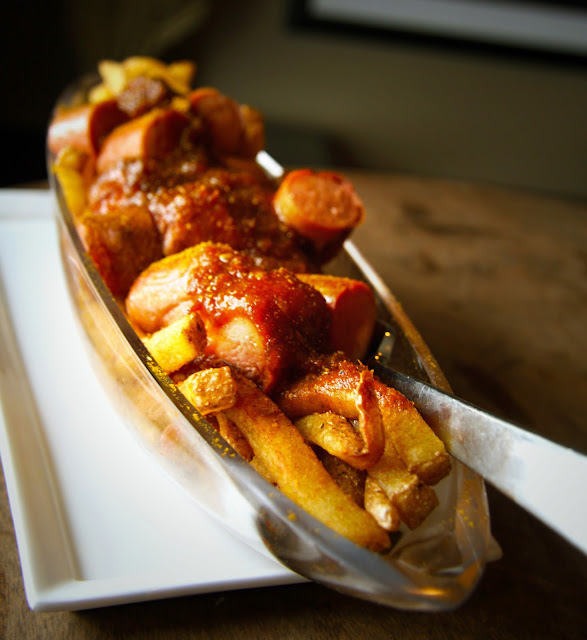 For a more "upscale" experience similar to eating gourmet poutine in Toronto or gastro bánh mi in New York, you can have currywurst served on chinaware with champagne at Bier's Kudamm 195 on Kurfürstendamm in Charlottenburg. Thanks for selecting this post as one of the foodbuzz top 9 today! Yum, yum...! I love eating Currywurst too from time to time, glad that I can get it everywhere here in Germany :)! Das ist typisch "Ostdeutsch" mit der Currywurst und wird heute noch gern an der Imbissbude gegessen. cool recipe! thanks for sharing, we feel your pain over here too. :) saving to cookmarked.com! ...I miss Germany. .. all the delicious foods over there... I did 2 tours over there when I was in the Army and American food just wasn't the same after that! I absolutely loved Currywurst Ketchup from the local grocery store.